The purpose of this tutorial is to show how to use PhoneGap to turn an AppStudio project into a native iOS app. Normally, AppStudio produces webapps, which are installed through the browser and can be saved to the Home screen. If you want to create an app which is distributed through Apple's App Store, you need to compile it using Apple's XCode SDK. PhoneGap lets you do this with no change to your code. PhoneGap also gives you access to features that are not available to AppStudio. These include the compass, contacts and notication. In addition, you can develop your own native code extensions. Here's a good introduction to creating PhoneGap plugins. PhoneGap has two methods of doing this. The easier one is PhoneGap Build. Use "Build Native App on the Run menu to upload your project to their site. In a few minutes, you can download app-store ready apps for Apple iOS, Google Android and Windows Phone. The more complex method is PhoneGap CLI. You will need to download the full development stack, install and configure, then compile on your own machine. This method is free, but can be time consuming and tricky to set up. Here is a full comparison of Web Apps vs. PhoneGap apps. To use PhoneGap Build, choose "Build Native App" under the Run menu. Your app will be uploaded to PhoneGap's compilation service. You can check on the status of the builds using "Get Native Build Status". Files are usually ready to download in a minute or so. PhoneGap has a handy debugger - it's essential when things go wrong. PhoneGap Build will produce a .ipa file. The process for completing iOS builds is slightly different than that for other platforms: all iOS builds need to be signed by a developer certificate and a provisioning profile, that is tied to your Apple developer account and the device you wish to test on. Note: Since PhoneGap Build uses Apple's standard development process to build applications, you will need to sign up for their developer program to build iOS applications on PhoneGap Build. You will also need a Mac (as of Feb. 2014 must run at least OS X 10.8.4 AKA Mountain Lion and XCode 5) to configure your certificate and provisioning profile. For more information, read this. Once you have built your iOS app using PhoneGap, you can submit to the iTunes App Store. 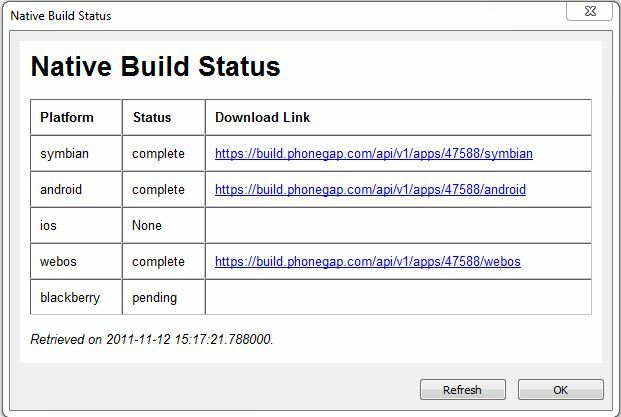 AppStudio installs with a demo PhoneGap Build account. You'll want to set up your own account to use. It's quick and easy to do. Information on using the PhoneGap CLI with AppStudio is here.